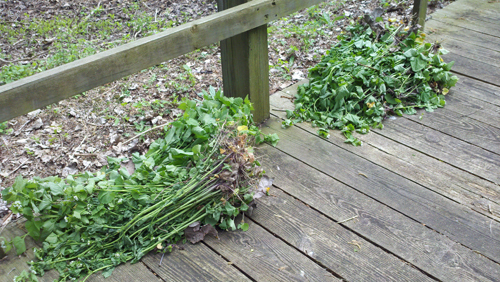 Help us keep the boardwalk area free from garlic mustard, an invasive plant that out competes native vegetation! Each year new seeds are introduced by birds, animals, humans and plants that may have been missed years previously. 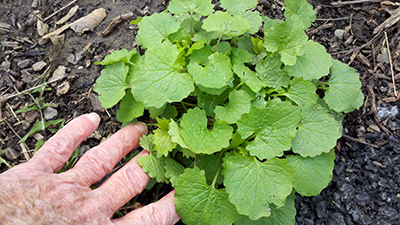 Thankfully, garlic mustard plants are easy to pull, so come and join us. We are coordinating with Kelly Schott (communications specialist at Magee Marsh) again this year and volunteers need only to fill out a DOW release form on the day of the pull. Last year, during the Biggest Week, black currant was in bloom and the birds were very attracted to it. Never have there been so many Cape May Warblers so close. This plant is one of several native plants that have responded to the removal of the garlic mustard. In his blog, Jim McCormac, highlighted our efforts at the boardwalk over the years and talked about the black currant comeback. It was a welcome acknowledgement of our work. We'll pull Garlic Mustard from noon until 3 pm. Volunteers, plan to meet Kelly (or her assistant) at the west end of the boardwalk at noon to sign a liability release form. If you can’t be there at the start, find us on the boardwalk and sign a form before you start work. 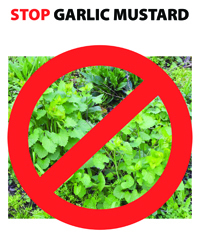 We are not be permitted to pull garlic mustard outside of the scheduled times. Dates will be posted on the Friends of Magee Marsh Facebook page and at FriendsofMageeMarsh.org. In case of rain, that date will be rescheduled. call her at 216 219 8430. 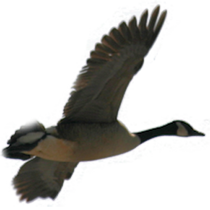 The current time at Magee Marsh is - 23:57:37 EDT (when this page loaded).